UPDATE 06/27/12: In a disturbing update about the death of 2-year Jack Redin, killed by two dogs on a property adjacent to his home, NewsandSentinal.com reports that the Sweeney brothers, David and Daniel, are the sons of Third Judicial Circuit Court Judge Timothy Sweeney. Daniel Sweeney is allegedly the owner of the two dogs, but his brother David Sweeney installed an underground invisible fence around his property so that he could care for his brother's dogs. The article also points out that the Pleasants County Sheriff's Office cannot confirm the breeds of the dogs, as apparently they have not asked the local veterinarian who had been keeping them in quarantine. The typical mislabels for pit bull-mix dogs were offered up by the sheriff's office: lab-mix and boxer-mix. Both dogs were put down over the weekend. An autopsy report on the child's death has not been released. No charges have been filed nor are any expected. 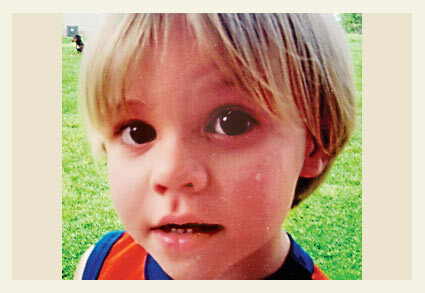 On Friday, MetroNews published an update about the fatal dog mauling of 2-year old Jack Redin. Sheriff's Deputy Steve McFarland said that Jack and three other children had been playing in the family's yard that day. Jack had been riding around on a battery-powered four wheeler when he wandered away from the group into the neighbor's yard. When family members realized he was missing, they began to search adjacent properties with the help of neighbors. "The whole incident happened quickly," said McFarland. No one actually saw the attack, but witnesses did see the boy's father find his son's lifeless body. The two dogs did not belong to the property owner David Sweeney; the animals belonged to his brother Daniel Sweeney. An invisible fence was dug beneath the ground to keep the dogs contained. It's unknown how long David had been caring for the dogs.1 David was not home at the time of the attack. Funeral services for the boy took place Saturday afternoon in Parkersburg. Pleasants County Sheriff's officials have confirmed that 2-year old Jack Redin was killed Wednesday after he wandered into a neighbor's yard and was attacked by two pit bull-mix dogs. The dogs had been confined by an "electric fence" buried beneath the ground, but acted as no barrier to a child coming onto the property. The dogs have been removed from the home and quarantined pending legal proceedings. The name of the dogs' owner has not been released. St. Marys, WV - In a developing story, a 2-year old boy was attacked and killed by two dogs after he walked into his neighbor's yard while playing. West Virginia State Police and Pleasants County Sheriff's Office responded to the scene around 1 pm after the boy's father made an emergency call. The dogs were described as "mixed-breed." The boy's father discovered him in the yard behind the neighbor's residence, according to police. More details are expected Thursday. 1The dogs have also been called mixed-breed and boxer-mix -- common names used to describe pit bull-mix dogs. It is very likely the dogs are pit bull-boxer mixes, as the cross of the two breeds is not unusual. From the comments that are up today (13 June 2012), it looks like two have been removed that were crucifying the parents…this even though the details of the case won't appear til Thursday. Thus no reason for the pit fans to already start making sure it's everyone's fault but the dogs', right? I'm waiting with bated breath for the details to come out, bet they are too. Here we go again. Another child killed by dogs. Of the "mixed breed" variety. I'll betcha money that they're pit bull mixes, and that it will be very easy to see the pit side of the mix. There ya go. The pit fans knew as well as we did that these 'mix-breeds' would turn out to be pit bulls. As with the recent mauling of a 2-yr-old in Memphis, in today's world where "your right to own a vicious breed dog" is more important than the right of neighborhood children to run and play freely and be safe. These dogs should be behind very tall double fences that are securely padlocked. I'm sure you all saw the fencing around the backyard of the house where the child was mauled in Memphis. That child had been allowed to come and play in that yard before. Where was the secure fence to keep children out? No one should be allowed to have an electric fence with these dogs. I'm sure it took only seconds to a minute for this death to occur. Every city needs laws to protect these children of tax-paying citizens from dangerous dogs!!! I've been stalked by dogs in yards with those "invisible" fences. The fact that such a fence was there did not reassure me. A few years ago we kept a stray that I now know was a pit mix ..didn't know squat about them then…and she learned quickly that if she got a running start, she could just run through the shock. She started living with neighbors after we had her spayed, but killed their yorkie a few weeks later. I didn' know she had pit until I recently came across some pics of her. Its worth considering that if the boy had fallen into a swimming pool and drowned, the owner would be liable, the pool company would be liable, etc… Hope for a big lawsuit in this one. AU, this is one reason why the Maryland ruling is so important. If the mutant owner (I mean, the owner of the mutant) isn't insured, most lawyers won't take the case to sue. Even if a lawyer does, getting a judgment doesn't help if the mutant owner is pretty much penniless. This is (IMO) why we need laws that not only make people liable, but include jail time for the owner if a dog seriously hurts or kills someone. If the child fell into the neighbor's pool, the neighbor would be fully liable, which is why there are lots of rules regarding containment of your pool area. It is even more important to properly contain fighting breeds or mixes thereof, except that the fighting breed lobbyists work to increase deaths and injuries by opposing proper containment. An electric fence is useless for a pit bull or pit mix. Anyone with even the slightest knowledge of dog requirements knows this, but by opposing laws that require proper containment, the pit bull lobbyists set up their own dogs. If you wanted to really put the screws to the pit nuts, one could "tweak" the civil code in such a way that damages in cases like these can't be discharged in bankruptcy. For the dog owner AND the landlord. Agreed the owner belongs in jail. I keep saying that, unless the dog attack is a clear cut case of self defense, the dog must be summarily put down and the owner arrested for assault. Its worth considering that if the dog owner had SHOT that little boy his gun collection would be GONE and he would be in JAIL. We do it to gun owners, why don't we do it to dog owners? This story is appalling on various fronts. First of all, that the person who was keeping these mutants would immediately try to dodge responsibility by saying 'oh well they ain't mine'. Second of all, this David Sweeny must have been keeping these mutants for quite awhile, likely with some idea of permanently. I mean, you don't install an electric fence because a dog is with you for a week or two, or even a couple of months. But what I find really appalling — and more dangerous than for this one case — is the tendency I'm seeing more and more often, for pit bull owners to think an electric fence (cheaper than a real one) is a way to meet containment requirements for their monsters. An electric fence is a dangerous thing to use with any dog. If kids come up to greet or treat the dog, thus unintentionally luring the dog into the shock zone, a dog can quickly learn to hate kids — "Kids approaching means I get shocked; kids are even more dangerous when they offer me a treat, then I surely get shocked". Shock fences teach dogs to hate other dogs for the same reason. A request by a passing dog for a friendly meet and greet results in a shock. "Friendly-acting dogs are dangerous!" Lots of dogs find out (often by accident) that they can grab freedom for the price of a single shock as they dash past the buried cable. They aren't, however, willing to pay the same price to come back to the boring yard — so they go roaming and might not go home even when they get hungry and tired. Know they'll get shocked again. All of this is bad enough when it's about a normal dog. But to use this kind of shock treatment on a pit bull? One that can escape as easily as any real dog, and already was willing to attack without provocation, let alone after being shocked many times? All this aside from the fact that the electric fence indeed doesn't keep children and other dogs from wandering into the mutant's yard and approaching it. Ready to randomly attack anyway by its very genes, the pit bull has now been shock-trained that kids are bad news. Electric fences plus pit bulls is a nightmare scenario. I hope something happens soon, some billion dollar law suit (maybe against the manufacturers of these fences, or some vendor that installed one knowing the dog/s was/were pit bull/s). Or correction of legislation, so that only a real fence is considered legally adequate containment. Something, because otherwise we have a lot more tragedies brewing. "I mean, you don't install an electric fence because a dog is with you for a week or two, or even a couple of months." — Exactly. This little boy's death is a heart wrenching mess as authorities likely can do nothing at all. That he was just missing for a very short while is all the more monumentally painful. I wish so much that the neighborhood had dealt with their pit bull problem BEFORE this child died. Your neighbors have pit bulls, you have a problem. Your neighbors have improperly contained pit bulls, you have a double problem. I hope that people will be proactive about the dangers of fighting breeds in their neighborhoods. Take action before the inevitable occurs. "She started living with neighbors after we had her spayed, but killed their yorkie a few weeks later." Could I send out a plea to anyone with beloved pets? Please never, ever bring a pit bull or pit bull mix into your home for any reason, no matter what anyone tells you, or how good they "seem" to be with your pets. They can be fine one day, and kill the next for no reason at all. Please protect your pets from a terrible death. Please also make sure that a stray pit bull or mix is picked up promptly by animal control. Pit bulls have been selectively bred to have a high pain threshold, which is why they keep attacking (and fighting) even when injured. This is why electric fences are useless with pit bulls and pit mixes. Candormd, you make some very good points. And, sorry to say, there are pit bulls in my neighborhood. I've gotten in the habit of sending landlord notification letters, as all of the pits have been housed on rental properties. In one case, the pit vanished a few days after I sent the letter. I'm not sure about what happened to the pit in one of the other cases. As for the third pit, I think it's still there, and I'm about to write another letter to the landlord. 1. I send them certified, return receipt requested. That way, I know that they were at least received. Whether they were actually read is another matter. 2. I copy a local personal injury attorney in on them. We go back a long way, and he doesn't charge me for being copied on my correspondence. I might also mention that he has tried pit bull cases, and, in his words, "They're nasty!" Your Quiet Neighbor, you are right on target. It is time for everyone to be proactive and there are many ways to do this. Create a paper trail, with proper notification to all. 9 times out of 10, the landlord has no idea that the tenant has fighting breeds, and the tenant is breaking the terms of their lease. If the landlord is notified by registered letter, they can't ignore it. The landlord will pay the price when the inevitable tragedy occurs, and if they have been notified then they can't deny they knew. For those who must remain anonymous for other reasons, notify anonymously or better yet for a reasonable fee have an attorney do it. This will literally save lives. This works for notifying any property owner. You can do a local owner search in your deeds office, and many are online now. If these neighbors had put this neighbor on notice, and contacted his mortgage company and notified insurance companies licensed to sell insurance in that state, as well as filed formal complaints about lack of proper containment to the city, then this child would likely be alive. Pit bull owners thrive on inaction by neighbors. That is how fighting breed owners can get away with preying on their community. (Inaction includes people who just make verbal complaints to animal control, which is practically useless. You must create formal written complaints with ALL authorities.). As for this property owner, he harbored the dogs on his property. They are his responsibility. The little boy's grandfather is a local Reverend. There just aren't words. Jack Walker Redin, of St. Marys, born March 12, 2010, went to be with the Lord Jesus on Wednesday, June 13, 2012. He was preceded in death by his grandfather, Wm. Ben Redin. He was the beloved son of Lonnie and April Redin and cherished brother of Lydia. He is also survived by his grandparents, Betty Redin of Walker and Rev. Tom and Tammy Blake of St. Marys; aunts and uncles, Ben and Nancy Redin of Walker, Rosetta Joiner of Kansas, Jill Blake of St. Marys, Mandy and John Conger of Vienna, and Jason and Crystal Blake of Charles Town; as well as many cousins. If this father gives a hoot about his dead child, he will NOT cover up the truth of the breed. The Pitbull type dogs were identified as such and maybe they don't want to get the outrage of people who again ask WHY PITBULLS around a child? Why did you believe the pitbull lies? But worse than taking the questions and backlash is letting this child die and not having his life and death teach others a lesson so other children can be saved. Dec. 2010 – "Pleasants County Prosecutor Tim Sweeney was appointed to fill the judge vacancy in the Third Judicial Circuit … Sweeney has been the Pleasants County prosecutor since 1985 and was an assistant prosecutor before his election. He has been in practice for 30 years with various law firms, including White and Sweeney, Sweeney and Ballard and the Sweeney Law Firm. He was also general counsel for Pleasants County Bank for nine years." Interestingly, one of his biggest cases as prosecutor (the case of a father allegedly killing his three-month old son) was overturned by the Supreme Court of Appeals in November 2010 (just days before being appointed judge) partly because his opening statements inflamed jurors. "On appeal, Chief Justice Robin Davis and Justices Brent Benjamin, Menis Ketchum, and Thomas McHugh found [Tim] Sweeney's comments so damaging as to require reversal." Upon learning of the high court's reversal, Pleasants County Prosecutor Tim Sweeney promised to "take Richard Allen Poore back to trial as quickly as possible." About 15 days later, Governor Earl Ray Tomblin appointed him to Third Judicial Circuit Judge. The vacancy Sweeney fulfilled was of Circuit Judge Robert Holland who was at the helm during the Poore trial. Judge Holland died in September 2010. Looks like the second trial of Richard Allan Poore never happened.